I've written a novella entitled The Lady of the Wheel (La Ruotaia). The book is issued by Legas, which publishes the journal Arba Sicula (Sicilian Dawn) and other Sicilian-oriented literature. In recent years I have written genealogy columns for several venues. I give genealogy lectures, most recently at the Centro Culturale Italiano di Buffalo (CCIB), and I do genealogical research for Americans of Sicilian descent. 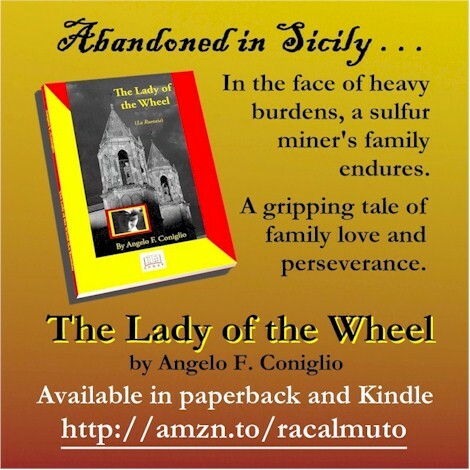 The book is historical fiction, inspired by my experiences in Sicilian genealogical research. It tells the story of foundlings and sulfur mine workers and life in their community of Racalmuto during the late 1800s in Sicily. Interspersed in the tale are episodes derived from the real-life experiences of my family, which originated in a small Sicilian town. I tried to weave into the story some of the customs and social conditions that went into the formation of the Sicilian culture and character. In doing so, in an informal way, I wanted to explain the processes by which births, marriages and deaths were reported and recorded in Sicily at that time, and how those records reflect the lives of its citizens. Sicily was a poor and oppressed land that contributed the majority of Italian immigrants to America during the ‘Great Migration’ of the late nineteenth and early twentieth centuries. I believe that American descendants of immigrants of any nationality will recognize some resonance with their own families’ experiences when reading this book. The book (84 pages, ISBN-10: 1-881901-86-6 / 1881901866; ISBN-13: 978-1-881901-86-0 / 9781881901860)may be purchased in paperback at Amazon.com. It's also available as an e-book on Kindle. If you aren't near the retail outlets listed above, or near me (AFConiglio@aol.com) in the Buffalo area, you can also order the paperback directly from the publisher. Turnaround is very prompt. To order from the publisher, send a check for $12 for each book ordered, plus $3 shipping ($0.50 shipping for each additional book), to Legas, PO Box 149, Mineola, New York 11501. New York State residents please add 8.65% ($1.04) per book ordered. Ann Tatangelo, professional genealogist: [Coniglio has] managed to include all kinds of factual information about life in Sicily, and the hardships the people suffered . . . the ending was great, too. Charles Gelia, descendant of Racalmuto ancestors: . . . . a straight-forward, compact story, as a novelette should be, artfully written in a non-literary style so that it read and sounded to me as though it was being told to me over a Sunday dinner by my father or my grandfather. Only my grandfather could have told me about life in Sicily in such truthful detail, but he never did. Over the years I've read everything I could get my hands on about life in Sicily during my grandfather's time there so I could understand truly why he left. Now I know. Laurie Galbo, family researcher: Very good read. I do my own Sicilian family research and I know a lot of research went into this book in regards to life in Sicily, mining and family traditions, as well as foundling children. The author uses some Sicilian vocabulary with English translation for key words and phrases. Life in Sicily in the 1800's was extremely difficult. This story portrays that honestly, but it also portrays love of family and endless hope. John Puma, an American expatriate in Sicily: A lovely book ~ [although] with . . . gruesome undertones, [it is] a sweet story. [Previously], I have been able to understand only part of the story of the 'carusi'. I did not realize that it was a situation of virtual slavery. The dialect lessons were helpful, too. Victoria Calabrese, PhD candidate, Italian History: . . . an interesting glimpse into what life was like [in nineteenth-century Sicily]. Karen La Rosa, proprietor of the Siculo-centric website LA ROSAWORKS: . . . A quick, well researched read that, in the simplest way, reminds of the hardships our ancestors faced. Lovely, warm characters and sense of place. One day Nino was working in the sulfur mine, at the end of a tunnel in an area which had been widened into a chamber that could hold several pickmen and their boys. Nino's son Totò was working with him. The pickmen, when working together in this way, would fall into a rhythm, chanting nonsense syllables, each string ending with an “Ummph!” as their picks struck the rock in unison. Totò struggled to keep up with the growing pile of sulfur ore, but as he was filling his sack, he mistakenly picked up a rock from the pile belonging to the next miner, "u Bruttu". The man’s cruel face, hairy back and bulging muscles warranted the only name he was known by, “the Brute”. Seeing the boy pick up ore that belonged to him, u Bruttu launched a mighty swing at Totò. Luckily, the lad was nimble. He jumped to the side so that the huge hand struck a glancing blow, nevertheless driving him against the rock face, and inflicting a gash on his shoulder. Nino, much smaller than u Bruttu, stood his ground. The hairy brute took a step towards him and started to speak, but just as he opened his mouth, Nino took a mighty swing, from his knees to the point of the Brute’s jaw. Years of chopping sulfur had given Nino arms of steel, and the big man’s jaw snapped shut, breaking several teeth, and he slumped back, unconscious. The other miners and their carusi stared open-mouthed, as did Totò. Nino looked at his son’s shoulder, dismissed the wound as a scratch, and said, “All right, don't stand there, fill your sack and go! And don't pick up the wrong ore!” He then turned to the others and said “See that none of you, miner or carusu, ever lays a hand on my son.” And with that he raised his pick and resumed his relentless attack on the vein of sulfur. Click HERE for more about foundlings.